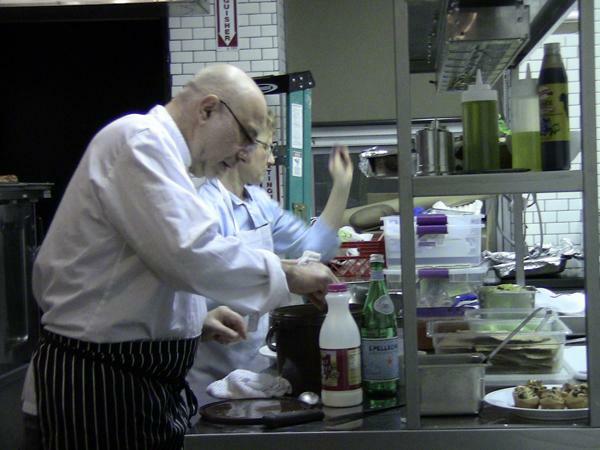 Former Chicago chef Erwin Dreschler and pastry chef Stephanie Samuels prepare dinner courses for a group of personal friends at the "pop-up" restaurant on Chicago Avenue. Eric Singer rearranged tables, organized about 200 pieces of glassware and sent in a frying equipment for repair, all in preparation for a dinner Wednesday at his new restaurant at 1307 Chicago Ave.
And he’s going to be one of the guests at the dinner. Singer, who owns the Lucky Platter restaurant on Main Street, has partnered with Evanston property-owner Craig Golden to open his new restaurant. He said that he invites guest chefs, many of whom he personally knows, to prepare dinner series on select days. Though the restaurant has not formally opened, it hosted one of its first dinners on Valentine’s Day with the restaurant group Feast & Imbibe. Singer said he wants to invite chefs around Chicago to showcase their skills at the venue. Pop-up restaurants have gained popularity as temporary eateries known for their off-the-cuff menus, and Singer’s restaurant is no exception. On Tuesday, the restaurant had chefs from the Chicago-based inn Longman & Eagle prepare cuisines including sea urchin custard, wild boar bolognese and charred confit of pacific octopus. Singer’s restaurant is different from most underground pop-up restaurants in that it is licensed by the city. Singer will appear in front of a city committee Thursday to propose a new liquor license that would allow customers to bring their own beverages to the restaurant. The former owner of Erwin Cafe in Chicago, Dreschler said he had discussed concepts of using the space for culinary educational purposes such as wine tasting with Singer, who used to teach in the culinary school of Kendall College in Chicago. Although the pop-up restaurant does not have a website yet, it has gained a following from fans of guest chefs, who use social media to advertise appearances at pop-up restaurants like Singer’s. Singer said the second month of operation will be an “important piece of the puzzle” with the impending BYOB liquor provision and a website in construction. Singer said the restaurant may never have a formal opening. “It’s kind of an un-traditional concept, so I’m not sure if we need a traditional opening,” Singer said.